Congratulations to Mya in 4LA, Amy in 5SC, Chloe in 5CG and Dominika in 6LG for winning the Fairtrade coaster competition. The judges found choosing the winners extremely difficult as the standard of artwork and creativity was so high. The coasters will be printed and used within our staff and meeting rooms to highlight the importance of buying Fairtrade products. On Friday 8th March 16 pupils from year 6 took part in our Fairtrade Biscuit Bake Off. They created their own recipes using as many Fairtrade ingredients as possible, such as chocolate, sugar, bananas and cocoa powder. The pupils worked well together and all made delicious biscuits with the smell of baking filling the school. Our local Councillors Bob Smytherman and Hazel Thorpe joined us to judge the biscuits, which they found extremely difficult as they both said the standard was so high. The biscuits were judged on appearance, texture and taste. The winners were Tegan and Kedar, with their Fairtrade triple chocolate cookies. Congratulations to them, and to all the year 6 pupils who took part. During assembly on Monday 4th March Ellie from Chartwells came in to talk to us about Fairtrade. We talked about the importance of buying Fairtrade products so that farmers who grow foods such as bananas, cocoa beans, nuts, tea, coffee, vanilla etc. receive fair pay. Farmers who receive Fairtrade pay for their products are able to support their communities by helping to build schools and hospitals, and send their children to secondary education. Congratulations to Suzi in 3BA, Jason in 4LJ, Amy in 4LA and Safari in 5AH for winning the Fairtrade bunting competition. Judging the winners was an extremely difficult task as we saw such creative designs. Our Fairtrade ‘Biscuit Bake Off’ took place on Tuesday 27th February 2018. All pupils in year 6 had the opportunity, with a partner, to create their own recipes using as many Fairtrade ingredients as possible. We had lots of entries with Mrs Watts and Mrs Mayes choosing the best 8 to take part in the bake off. All teams worked well together and everyone produced excellent and very tasty biscuits using Fairtrade ingredients such as sugar, icing sugar, bananas, dark, milk and white chocolate and cocoa powder. Our judges had a very difficult decision to make and scored each biscuits on taste, appearance and texture. Some judges found the decision so hard to make that they went back for a second tasting! The winners were Hannah and Jennifer in 6RW, with their chocolate drizzle biscuits. 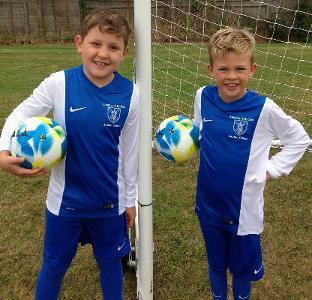 Congratulations to them both and well done to everyone who take part. 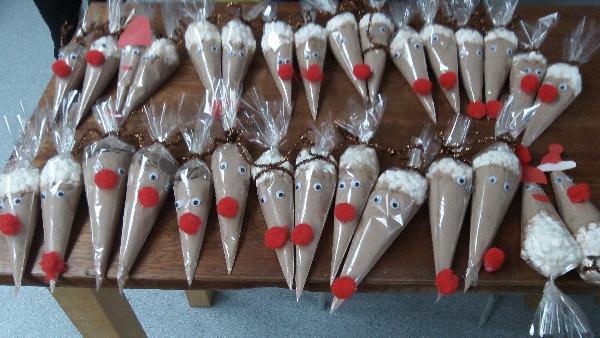 During Eco Club the committee made hot chocolate cones for Christmas using Fairtrade hot chocolate and chocolate buttons. 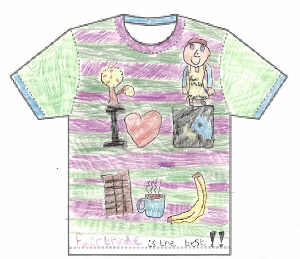 Worthing Fairtrade Town Steering Group are pleased to announce that Liberty in year 4 is the winner of their 'Design a Fairtrade t-shirt' competition. Liberty has won a £20.00 WHSmith voucher, congratulations! Congratulations to Amy in year 3, Safari in year 4 and Greta in year 5 on winning our 'Design a Fairtrade Wrapper' competition. They each received lots of lovely Fairtrade goodies! 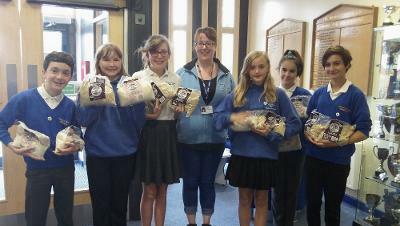 The Eco Committee decided to use funds raised last year to donate bags of rice to our Harvest Festival, with all donations going to Worthing Churches Homeless Project. We are also pleased to announce that we have sold another 90kg of rice, which has enabled a Malawian farmer to send a child to secondary education for one year. We are pleased to announce that between the P.E department and Fairtrade committee we have been able to purchase some Fairtrade footballs to use within school and clubs. 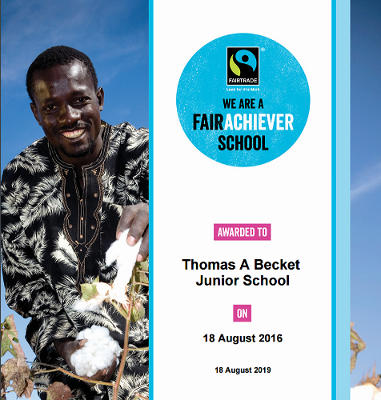 During the Summer term Mrs Mayes and Mrs Cherry applied for a Fairtrade award on behalf of the school, and we are pleased to announce that we have gained our 'Fair Achiever' Status. We are proud of our continuing work as an Eco School, and thank you for all of your awareness, hard work and dedication that makes this possible. The children entered a Fairtrade quiz during the E.Y.E Eco Summit event and we are pleased to announce that we came 1st and won £20.00 for Fairtrade items within school. Sir Peter Bottomley MP has kindly handed our letters regarding ending the era of tax havens for the super-rich to David Cameron. We are pleased to announce the Prime Minister has written back informing us how tremendously well written the letters were and how they show the pupils care about this important issue. He also mentions how much Sir Peter enjoyed judging our Fairtrade Biscuit Bake Off! 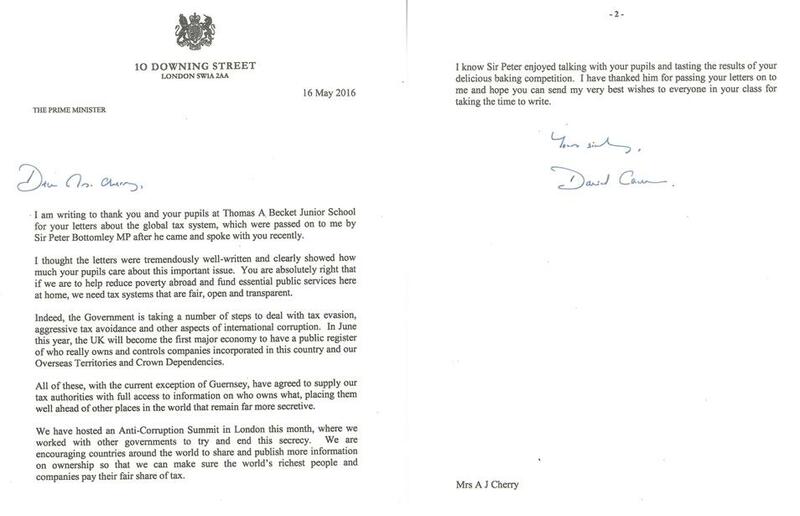 Children in 5CS wrote letters to David Cameron in support of ending the era of tax havens for the super-rich. The children were shocked to find out that 62 billionaires have the same wealth as the poorest half of the world combined and that poor countries lose $170 billion every year in taxes due to tax havens, which holds back the fight against poverty. The letters were given to Sir Peter Bottomley when he visited the school who said he would deliver them on the children's behalf. (For more information and an online petition you can sign, visit the Oxfam website). The annual Fairtrade Becket Biscuit Bake Off was held today, Friday 11th March 2016. The purpose of this event is to promote Fairtrade Fortnight and to encourage children to bake using Fairtrade ingredients. We had many entries and the best 8 were chosen to compete in the final. Competition was fierce. All teams produced a lovely batch of biscuits using Fairtrade ingredients such as bananas, sugar, chocolate and cocoa powder. Sir Peter Bottomley, MP for Worthing West, visited the school today and met with children in 5CS who had been working on a Fairtrade topic. He then met with ‘Mary Berry and Paul Hollywood’, (alias Nessa and Benjamin) in the Cooking & Nutrition room to judge the biscuit competition. The biscuits were judged on appearance and taste. It was very close. All the biscuits were beautifully presented and tasted delicious. The winners were Javier and William, year 6, with their chocolate, oats and banana biscuits. A huge well done to them and to everyone who took part. We have been working with Worthing Fairtrade Steering Group and Just Trading Scotland in the rice challenge of eating someone out of poverty. In Malawi only 1 in 3 children attends High School and education is one of the most effective ways to escape poverty. By selling 90kg of rice this amount would enable a Malawian farmer to pay for a year’s basic secondary education for one child. 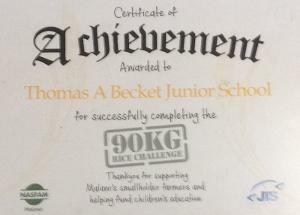 We would like to inform you that we were successful in our quest to sell 90kgs of rice and received a certificate from Just Trading Scotland to thank us for our support. Thank you to everyone who supported and purchased a bag of rice. With our kind donation from Sir Peter Bottomley of £30.00 towards our Rice challenge we purchased 12 bags of rice and donated these to Worthing Churches Homeless Project. Abi Harley, Volunteer Co-ordinator and Community Fundraiser, visited school to collect our donation and thanked us for this kind gesture towards their food banks. 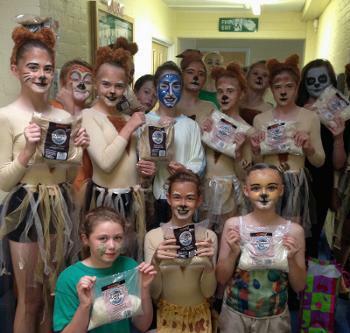 During the Year 7 Lion King production we sold our Fairtrade rice and by the end of the last show we had managed to reach our target of 90kg bags sold. This will enable a Malawian farmer to pay for a year’s basic secondary education for one child. The Year 7 children have been looking at the importance of education and the impact it has on the future of children around the world. 58 million children around the world are still missing out on education and our children have been thinking about how that is not acceptable. They have been thinking about what they would do if they were leaders and how education would be on their agendas. The children sent their ideas to Sir Peter Bottomley MP who has passed them to David Cameron on our behalf, to support the issue at the UN summit in September. We have been taking part in the Rice challenge, in partnership with Scotland’s Just Trading, whereby if we sell 90kg of rice, this would enable a Malawian farmer to pay for a year’s basic secondary education for one child. We have also been looking at how the UK could make trade more fairer and how adopting the new UN Sustainable Development Goals (SDGs) through trade would be a powerful way to boost income and tackle poverty. The children have raised these issues with the Prime Minister, hoping he will support our ideas of new trade policies which would result in fairer and more sustainable trade. It is good you are concerned about these important issues. I am too. In Parliament, I served years ago on the Select Committee on Development overseas. Outside, I served as a Trustee of Christian Aid. To save time, I have sent your letter to David Cameron, the Prime Minister. I hope his office or the Department for International Development will respond to you directly, with a copy to me. This may come during the summer. I would welcome meeting you but most days this term require me to be at Westminster. Your teachers might be in contact with Sally Myers here with me on 0207 219 1060 to see if an arrangement can be agreed. Here is a Charities Aid Foundation voucher for £30. Please add it to the sums you are raising. Do write in the name of a charity. You will know that a previous Prime Minister, Gordon Brown, did much to help set the Development Goals. There has been progress. Before that, in 1980 I sat with Margaret Thatcher in her study. We were discussing the similar points for children around the world that she would be making at the United Nations. You are right to mention the importance of trade, especially fair trade and fair opportunities for trade. Let us hope we can discuss these issues together.